High-definition paneling for distinct styles with shadow lines. Make a statement with decorative glass, then match sidelites, transoms and coordinating garage door windows to enhance the total curb appeal of your home. 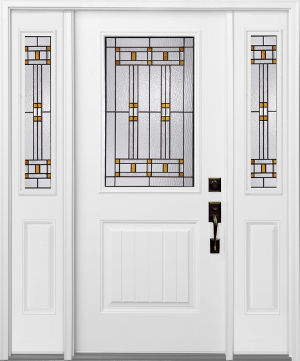 Energy efficient, Clopay steel door systems feature a solid insulating core, 12" LVL (laminated veneer lumber) lock block to secure the lock set, and high performance composite bottom rails that resist rot and insect damage. Click here to see the High Definition Steel Doors with Glass. Click here to see the High Definition Steel Solid Panel Doors.